If you’ve been looking through the membership card gallery lately, you may have noticed Scott Wedemeyer’s unusual-looking card (shown at right; click to enlarge to get the full effect), which was one of the many orders we received on Purple Amnesty Day. Scott’s card is based on the University of Michigan’s football jersey, but with a twist: Scott has synesthesia, a condition that colors his visual perception of the world — literally. When he sees letters and numerals (among other things), they all have specific colors in addition to their “real” colors. His membership card, which we created based on his art direction, reflects the way a Michigan football jersey looks to him. It includes two flashes of purple, which is why he had to wait until Purple Amnesty Day to order it. As you might imagine, having synesthesia has a big effect on Scott’s perception of uniforms. I asked if he’d be willing to write something about this, and he readily agreed. I’ll now surrender the floor to him. It took nearly 20 years of my life for me to realize that these truths are entirely subjective, the result of the condition synesthesia (whose Greek roots mean “to sense together”). Numbers and colors, words and colors, intertwined permanently in the brain. Flashes of color appear in my head as I read text. As I see a letter or number, I also instantaneously “see” it glowing in color in my mind’s eye, suspended in a grey space. Much like the sun, it’s impossible to look at directly; it’s only glimpsed peripherally in the mind. Some psychologists think synesthesia is a vestige of the excessive patterns our brains record in infancy, as our psyches are trying to learn meaningful associations like “orange means hot.” As we mature, we cut the neural connections that serve no real purpose or meaning, except for some stray patterns that survive. No matter the cause, synesthetic responses are involuntary and consistent over time. S is always blue for me, and likely always will be. This has major implications for how I watch a sporting event. When I watch a game, I see players’ jersey numbers and names as having an additional layer of color. My beer-league hockey team’s uniforms, for example, use a blue/white Maple Leafs template, but I still think of my jersey as being green because I wear No. 3. Growing up in Ann Arbor, I would see a Michigan lineman’s No. 78 in yellow against the navy blue jersey, but I’d also perceive it in my head as warm-grey/purple-grey. Perfect numbers aside, it’s really the imperfect color associations that make sports interesting for me. Every player has a secondary color scheme that, whether attractive or ugly, adds more visual interest to the game. 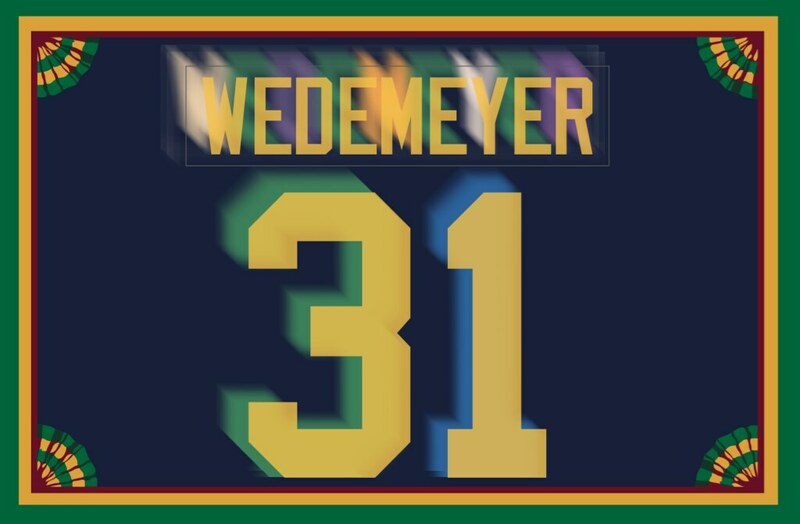 Memories of entire games are painted in strings of color based not just on team colors, but on prominent players’ jersey numbers and even last names. My mind’s pairing of names and colors goes beyond sports. In a sense, all of the people I know have “team colors” based on their first and last initials (which stand out in my mind more than the other letters in their names). For example, T.L. is dark green/dark grey; K.B. is purple/blue; J.P. is purple/kelly green (like the Mighty Ducks in the original movie). My own initials, S.W., give me team colors of blue and yellowish-tan. This isn’t like how some people claim to see “auras” of color around people. Instead, the very thought or sight of a person’s name triggers a flash of color that sort of washes around her or his identity in my head. Synesthesia can be a distraction, but it isn’t a handicap, and it’s certainly not a superpower. In fact, I really don’t think I’m that different from anyone else. All of our brains are pattern-making machines. We assign values to arbitrary symbols and make personal connections with them (yellow is my favorite color because I grew up a Pittsburgh fan; 73 was my dad’s number in college; and so on), and we color them a certain way in our memories, to be called up and viewed in the mind’s eye like a bright object that we can’t see directly but is “right over there” in our periphery. For some of us it’s just a bit more vivid. That’s synesthesia. Are there any other synesthetes out there, or anyone else with a unique mode of perception? How does it affect your uni-watching? Paul here. What a fascinating story! Major thanks to Scott for sharing it with us, and for being such a pleasure to work with as we developed his membership card and this entry. Too good for the Ticker: Every now and then MLB does something awesome, and yesterday was one of those times. 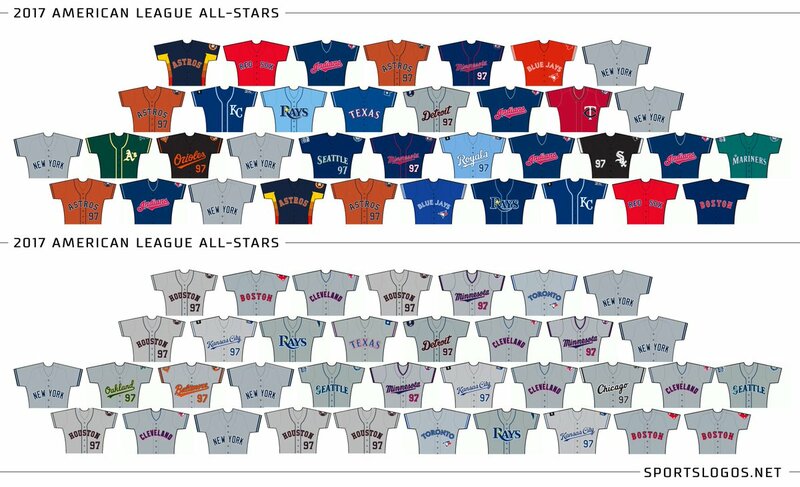 They created two really simple but really satisfying infographics — one each for the National and American Leagues — showing the team logo of each All-Star Game starter, broken down by year and by position. It’s really interesting to see, say, the long run of Cardinals logos at NL shortstop in the 1980s and ’90s (for Ozzie Smith, obviously), or the surprising long run of Tigers logos for AL catcher from the mid-’60s to the mid-’70s (for Bill Freehan, who at one point was named to 10 consecutive All-Star teams — seven as a starter), among lots of other interesting bits. The infographics are much too large to embed here on the site, so I’ll just link to them — National League and American League. You can read a little more about the graphics here. The graphics aren’t perfect. The main issue is that they’ve used the current logos for all teams — even the ones that have moved. So all of the Giants players are represented by the interlocking “SF,” even All-Stars who played for the New York Giants. Similarly, all Angels players, even from the 1960s and ’70s, are represented by the team’s current logo, which didn’t even exist until 2002. That’s not ideal, obviously, but I can understand why they did it, and some of the year-after-year logo repetition would have lost a lot of its cumulative oomph if they changed all the logos to be era-appropriate. And while it’s a little odd to see Oakland’s white “A” on a green background being used to represent a Philadelphia A’s player from the 1930s, it’s a good reminder that it’s the same franchise. Overall, I really like this. Kudos to all involved. Honestly, how did they approve that logo? Even without the alien connection, it’s such an odd design for an NFL team. Feels more like a European soccer club logo. I wondered if maybe it had some connection to Wofford College, but nope. Back to the drawing board, people. [Manfred] said he has had an “ongoing dialogue” with the Cleveland Indians’ ownership about phasing out the Chief Wahoo logo, which many think to be derogatory to Native Americans, but that it is unlikely to disappear completely this year. This is a cagey statement, because I don’t think anyone expected Wahoo to disappear this year. There have been several hints, however, that he might be mothballed next year. And by saying, “Nope, not this year,” Manfred appears to be adding another hint to the pile. He’s also making it clear that he remains in favor of Wahoo’s retirement, which is an important thing for him to keep on saying. Baseball News: The Brewers will celebrate the 35th anniversary of the 1982 AL Championship team by wearing home throwbacks for all three games of this weekend’s series against the Phillies. the Phils will wear powder blue road throwbacks (from Phil). … A pizza shop in St. Louis has a poster of a phantom 1949 Cardinals World Series program on display. The Cardinals finished a game behind the Dodgers for the pennant that year (from Alex Spanko). … An Ohio sports columnist would prefer the road team in the All-Star Game to wear alternate jerseys instead of grey. Chris Creamer of SportsLogos.Net showed what a All-Star team full of alternate jerseys would look like (from Phil). 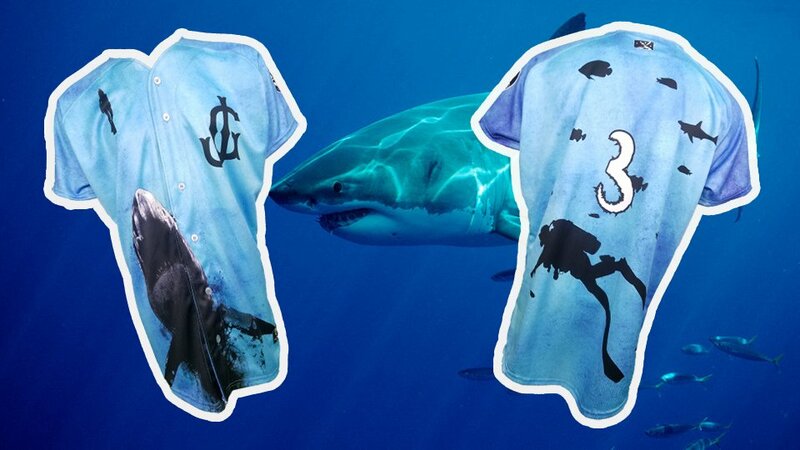 … The Jackson Generals will have jerseys for Shark Week Night (from Phil). … David Westfall spotted some uni inconsistencies in the 1997 All-Star Game. First, Ken Griffey Jr. wore a sleeveless jersey while the rest of his Mariners teammates wore sleeves. Oddly enough, Griffey had a sleeved jersey hanging in his locker after the game. Also, Tony Gwynn had a gray Padres jersey, but teammate Ken Caminiti wore a blue alternate. 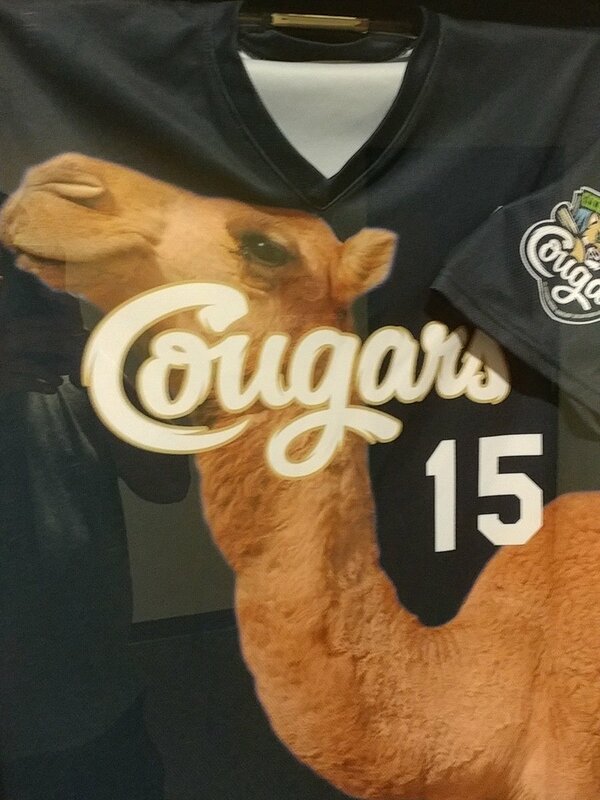 … The Kane County Cougars wore camel jerseys for “Hump Day” yesterday. Here’s another look (from @CraigCDMcigers). … The Chicago Police Department’s baseball team wears charcoal grey uniforms. … Hmmm, what’s wrong with this picture? 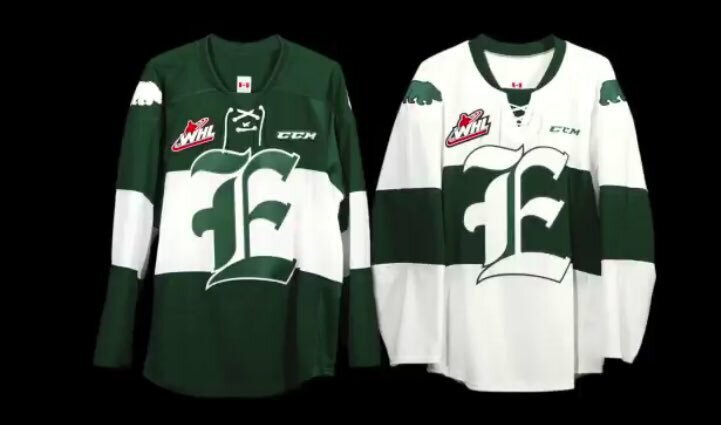 Hockey News: New jerseys for the Everett Silvertips of the WHL. Additional info here (from Shayne Pasquino). … Onondaga County intends to sell the naming rights to War Memorial Arena, the home of the AHL’s Syracuse Crunch. The new name will take the form of “[Advertiser Name] Arena at the War Memorial” (from Shane Bua). … Brad Bader still has a bunch of unused NHL pencils from the mid-1990s. He’s fond of the Nordiques one, and I always enjoy the Red Wings’ wordmark. … Here’s a look at the Coyotes’ logo history (from Phil). NBA News: Fanatics, the apparel company that will make and sell NBA replica jerseys starting this season, aims to become a new sort of retailer that is part tech company, part e-commerce expert, and part manufacturer (from Phil). … New T-Wolves forward Jimmy Butler is selling his Chicago mansion. He apparently had a closet with more than 500 pairs of shoes. … Lakers rookie and budding sneaker entrepreneur Lonzo Ball wore Nike sneakers in a Summer League game last night. … Do you live in the New York area and have a golden voice? The Nets are holding auditions to choose a new P.A. announcer. 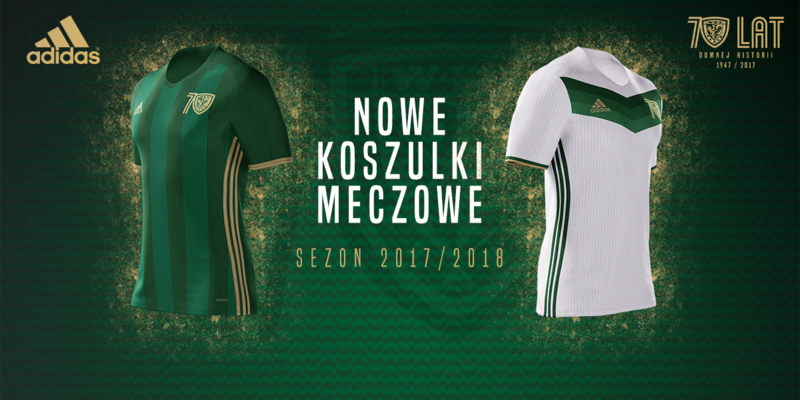 Soccer News: New shirts and new 70th anniversary badge for ÅšlÄ…sk WrocÅ‚aw, a Polish club (from Ed Å»elaski). … Also from Ed: New uniforms for Cracovia KrakÃ³w, who have switched from Macron to Puma. 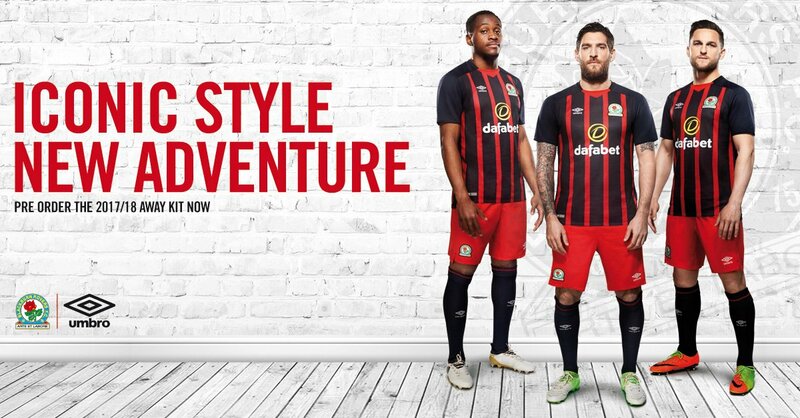 … The Blackburn Rovers updated their away kit (from @moodonthepitch). 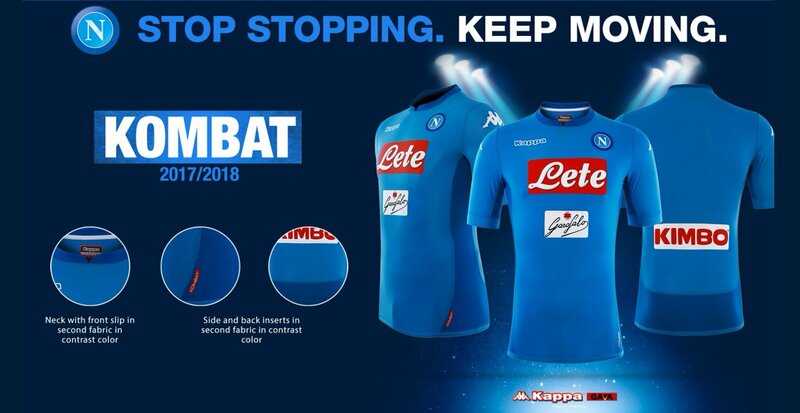 … New home jersey for SSC Napoli of Italy’s Serie A (from Edoardo Salvati). … Newcastle introduced a new third kit (from @NUFC_monkey). … Fans have expressed mixed reactions to Arsenal’s new black and pink third kit (from Ted Arnold). … Two Red Bull clubs, Germany’s RB Leipzig and Austria’s RB Salzburg, have identical new jerseys (from mark Coale). Grab Bag: Wimbledon has a strict all-white dress code. Yesterday, a doubles team was forced to change out of their dark-colored underwear (from Mike Styczen). … New flag for the city of Tulsa, Okla. (from Alex). … Time Inc. is considering a corporate name change. This reminds me of last year, when Tribune Publishing Co. changed its name to Tronc, a move that still draws ridicule in Chicago. 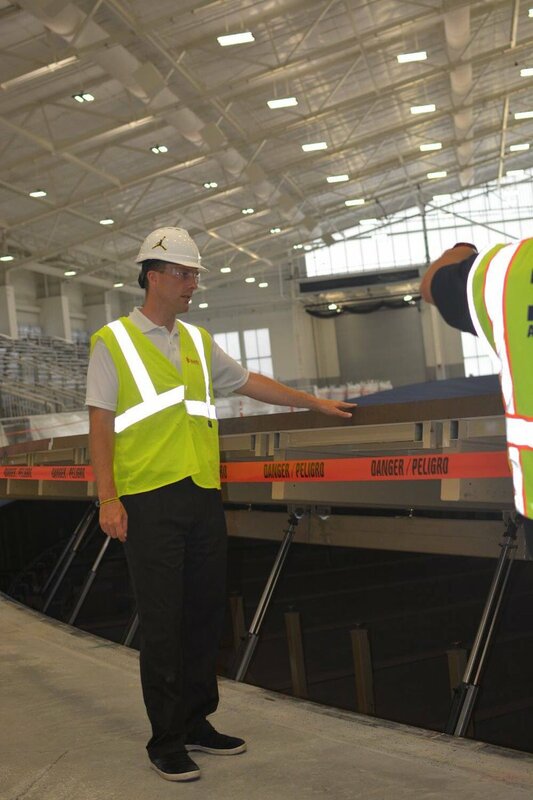 … Michigan, a Jordan Brand school, is building a new indoor track, and a someone on the construction site has a Jumpman logo on his hard hat (from Tyler Crum). … A few newspapers, including The Tennesseean and The Detroit Free Press, have new mastheads and logos that reflect their new affiliation with the USA Today Network. … Here are the liveries for the Honda Indy Toronto race this weekend (from Tim Dunn). … Font-based scandal: Pakistan Prime Minister Nawaz is being investigated about a falsified property deed. Officials found that while the deed is dated 2006, the font used in it, Microsoft’s Calibri, didn’t debut until 2007 (from Harris Celsi). … Here’s the story behind the personal logos for a handful of the players on the PGA Tour (from Joe Canales). I have a degree of synesthesia, but it’s not visual. Some sounds have associated scents. For example, a clarinet’s sound smells like oranges, but a tuba smells like wet grass. That’s so cool, I’ve always wondered what some of the more unusual forms of synesthesia are like. I bet encountering a surprise marching band is a nauseating mix of smells. Thanks for sharing! And thanks for sharing your story, Scott. How strange was it to find out that most other people don’t associate characters and colors like you do? I’ll take responsibility for that first typo! Glad you enjoyed my story. It was definitely a very weird moment realizing that not everyone else sees letters, numbers and colors the same way. I’d just assumed that everyone else KNEW that Q is purple, 4 is yellow, etc. Amazingly, it took all the way until my freshman year of college when I took a psych 101 class. I realize these associations probably have to do with holidays, weather, etc., but the associations are so strong, they are impossible for me to break. Low profile? Ha? They are a monopolistic behemoth that now controls merchandising for all four major sports! The implication is that Fanatics was low-profile and relatively unknown two years ago, which I think is true since they were mainly running through back end of various retail operations back then. They’ve only become well-known and front-facing somewhat recently. I only have Madden 15, I think I have seen that logo before. This is just conjecture, but it looks like the Panther’s were going for a Game of Thrones (A Song of Ice and Fire if we’re going to be pedantic) riff based on the house sigils/coats of arms in that world. They use the font from the show for the “Wofford is Coming” tagline and riff on the “Winter is Coming” motto of House Stark from the series. This was my impression, as well. That makes sense. Still doesn’t make it a good design, though. Yeah, it’s a “Game of Thrones” thing. May look great on a large scale, but when reduced has an otherwordly visage. Fascinating entry today – thanks for sharing, Scott! Your description, along with the visualization of the UW member card, offered a much clearer depiction of what synesthesia is like to experience than anything I’ve read before. Today’s UW entry should be included in classroom curricula on the subject! And yeah, the explanation based on vestigial patterning makes a lot of sense. We are al of us prone to over-patterning the world. Like, pretty much everyone sees a face when looking at an American three-prong electrical outlet. That is a false pattern: It’s an electrical outlet, not a face. Personally, and I suspect like a lot of people, I have strong color associations with certain digits (also months and days of the week). But the colors I associate with digits don’t usually appear as an involuntary visual image in my vision or mind’s eye, and they change over time. It’s more a question of, if you gave me a box of crayons and told me to color in digits on a page, I’d generally choose the same crayons for the same numbers if you tested me again the next week, and I’d do so without conciously thinking about the choice – but I might choose different crayons a year later. So: Not visual, not involuntary, not consistent over time, therefore not synesthesia. It had never occurred to me before that color association and synesthesia are different in kind, rather than degree. Want to echo this – thank you for sharing your story, Scott. I understand synesthesia a lot better than I ever have before. A truly excellent account. Many thanks for sharing. Thanks R.S. and Chance for your kind words. I’m glad this helped understand synesthesia. I’m willing to bet that Griffey wore that ASG jersey because weren’t him and Buhner the ones that pushed for sleeveless and the silver brimmed cap? Yeah, Griffey didn’t like sleeves. He cut them off every chance he got, probably figured correctly that he could get away with it in an exhibition game. Bummer that those MLB graphics don’t include the period-appropriate logos. But if they are doing it that way, shouldn’t all the Expos players have the curtly ‘W’ of the Nationals? I guess it’s just semantics but I’m a firm believer that teams should *not* get to keep any history/records if they move or change their name. It’s a different team to me (even if all the players and staff and coaches and even home market are the same). 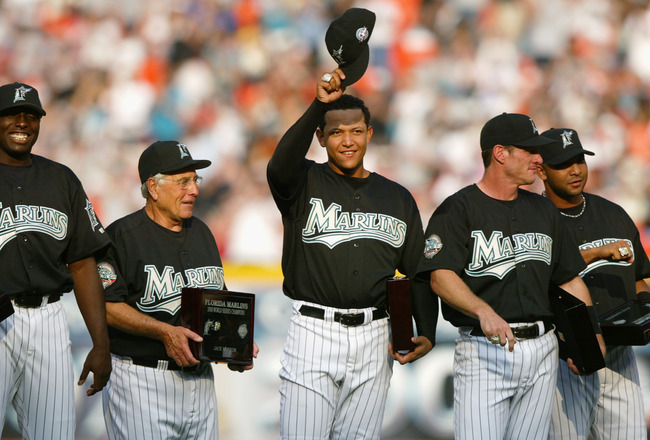 Semi-related note: I’m hoping if, baseball gods willing, the Marlins get sold that that new owner(s) revert the colors back to teal and black and forget the entire post-2003 Loria era ever happened. Bummer that those MLB graphics don’t include the period-appropriate logos. But if they are doing it that way, shouldn’t all the Expos players have the curtly ‘W’ of the Nationals? Yeah, this is why using period logos would have been a much better idea. Agreed, that was the first thing I noticed. No Brooklyn or New York era logos for the Dodgers and Giants respectively. Looks like when the team completely dumps their identity during relocation (Expos, Browns, Senators) MLB put in the old logos. But Giants, Braves, Dodgers, and Athletics maintained their nickname, so no old logos for their previous homes? And ditto on the Marlins, worse part is they had a perfectly good alternate logo with an M instead of an F they could have just swapped in when they became the Miami Marlins. Better still, the post-Loria Marlins ditch black entirely. Teal? Sure. Their current colors, minus black? Even better. 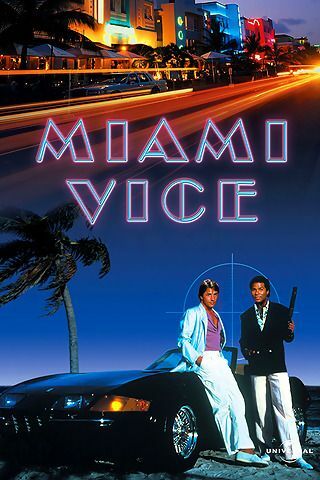 To me, Miami looks like this, or maybe this, or possibly this or this. Not like this or that. Black isn’t a bad base color; it would allow the other colors to pop. While most of us think of the Denver Nuggets rainbow jersey as blue with yellow trim, the original iteration was black, with green trim. Maybe a black cap and sleeves for the Marlins; socks too. But no farther; no black jerseys. To my way of thinking, the Miami rebrand of the Marlins was to right a wrong that occurred in their expansion year, as well as to christen the new park. Art Deco and neon was always the way to go with a team in this city, but they fell under the 1993 siren song of teal as a cheap ploy to move souvenirs. Sure, they could claim that aqua stands for the ocean and the color gave them a family resemblance to the Dolphins, but it was used in a dull way with an oddly complex marlin symbol. And black is fine, providing you use it with some restraint, which is anything but a given nowadays. I agree entirely with DJ and Walter: Black would be fine for the Marlins, if it could be used with restraint in order to make whatever their primary colors are more vibrant. But we now have 25 seasons of practical experience that tells us that a baseball team in Miami cannot use black with any kind of restraint. You give an MLB team in Miami any black at all, and within a couple of seasons black will be the team’s dominant, indeed very nearly only, color. Therefore, no black for the Marlins. None. No black accents or drop shadows or outlines, certainly no black caps or bills or even socks. Heck, the team should ban its players from wearing black shoes or black gloves. Zero tolerance. If the Marlins need a contrast color to make their primary hues pop, they can have gray or a very dark shade of green or purple or something. Or, heck, dark brown. But not black. New flag for the city of Tulsa, Okla. (from Alex). The article’s comments was just a string of haters. How depressing. The new flag is plenty good; I especially like the reference to the dreamcatcher of the state flag. The article’s comments was just a string of haters. Or, in other words, the article has a comment section. Also in other words, the new Tulsa flag is a new thing. I can’t really relate to the guy that found the grey uniforms in the ASG boring. I find the grey uniforms dignified and somehow clean in my mind. I don’t find the alternates less boring, but rather more clownish. But alas, mileage may vary. As much as I like colorful uniforms, I would like to leave the era of mix+match jerseys in the ’70s. The Sansabelt and pullover lend themselves to that treatment, unlike current styles. It would be better to pull for full monochromatic treatment in the near future. I think people would have perceived the grey uniforms as “less boring” if teams were allowed to wear their normal game hats. The ASG hats’ colors were very muted whereas many of the regular team hats have a pop of color that nicely rounds out the road uniform look. If teams would only treat the World Series with that level of dignity! Agree with all my heart. But I also agree with Jonathan that ASG players should wear their usual caps. For some of us, it’s the only time of the year we’ll catch a glimpse of certain teams’ unis–why mess with them and ruin the experience? why mess with them and ruin the experience? I Â¢an’t think of a $ingle rea$on. Brad Bader still has a bunch of unused NHL pencils from the mid-1990s. He’s fond of the Nordiques one, and I always enjoy the Red Wings’ wordmark. Cripes, the erasers must be like rocks! Once pencils get to be that old, just save ’em; they have more use as conversation pieces or collectors’ items. The MLB All-Star starter info graphic was a fun diversion. Not surprising that the starting pitcher would turnover so frequently, but does anyone have any theories on why 1B and LF would be so volatile for the AL? My guess is that in years that the game was held in national league parks they did not use the dh. If I remember right one year David ortiz started at first for the al. It took a while to see the panthers’ heads on the Panthers’ training camp logo. Because of “Wofford Is Coming”, I saw a terrier’s head–and a strange-looking one at that. 8:30 local time and I already learned about something new today. Thanks for sharing your story, Scott. Thanks Jeff for reading it! Everett Silvertips new jerseys appear to be for just this upcoming season I’m thinking. The Silvertips did something similar for their 10th season. They put their regular uniforms in the closet for the season and wore a set of home and road uniforms for just their 10th season to commemorate it. This practice of changing the uniforms for just one season to commemorate an anniversary was also done recently by their conference rival, the Kelowna Rockets. The Rockets wore fauxbacks for their 25th season in 2015-16 before returning back to their regular uniforms for the next season. I was sad about that as I thought the fauxback looked better for Kelowna than the regular uniforms. Here’s a look at the Coyotes’ logo history (from Phil). I agree with the writer’s opinion the Coyotes have been paddling backwards from an artistic point of view. This seems to plague all but a few expansion teams; At Square one, you have a vision and a spark, and everything is pure potential. After a few seasons, worry creeps in when the day-to-day drudgery of operating a team grinds the idealism out of the enterprise, and the franchises handlers begin to chase a moving target by shaping the franchises iconography into a pointedly middlebrow style. It’s not unlike when a niche-specific cable network (Think SyFy or TNN) grows tired of programming to the base and starts scheduling blocks of pro wrestling for the cheap ad dollars. Agreed, their kachina style logo was amazing. If anything they could have just switched up the colors in that to red, gold, and black and been set. The kachina coyote reminds me of ABBA: Nobody could stand it when it was in use, but after they retired it everyone said how wonderful it was. I have a question for you, if you don’t mind. 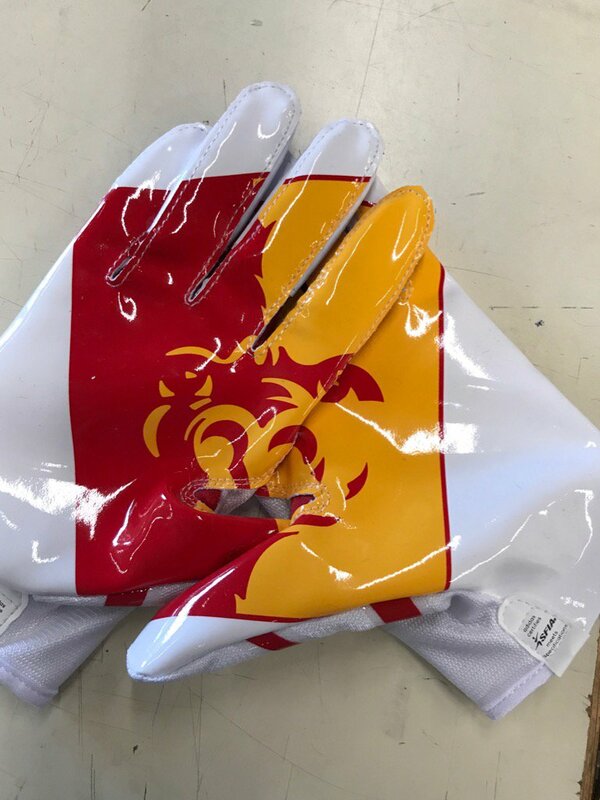 Often here on UniWatch, we see an old pic where we can only see part of a number, like the left half of a “6” that might also be an “8” – when you just see part of a number like that, do you see it in its “real” color until you can see the whole thing? Or does your mind sort of “pick” one? Thanks again! Good question Jay. If there was enough showing that my brain said ‘that’s a 6,’ I would involuntarily and immediately ‘see’ purple. But if there was no way to tell which number, then no, I wouldn’t have a synesthetic response until my brain determined the number and until then I would only see its ‘real’ color. To be clear, I always see the real actual color of the number, it’s just that I also see it in the synesthesia color, so my brain isn’t picking or switching. It’s like seeing both at the same time in a way that’s impossible to describe (my membership card is the closest visual representation I can think of). Thanks for asking! I might be very, very wrong in thinking this, but is Caminiti the last player to wear a dark alt in the ASG? I can’t remember anything but whites and greys post-1997. Sometimes an alt cap here or there (I specifically remember A-Rod wearing the blue Rangers cap with the red T instead of the white T in Seattle in 2001). And Paul, you might even know this offhand, but what was the Mets’ ASG record as far as wearing the plain white jersey/black-and-blue cap vs. the pinstripe jersey/blue cap during the “Mets in Black” era? Is it possible someone from the Padres, maybe sent from the marketing department, nudged Caminiti to wear that jersey since it was new for ’97? I believe that is accurate that Caminiti is the last player to wear a dark jersey in the ASG. My understanding was that he mistakenly signed the gray jersey and couldn’t wear it in the game. The idea itself is fairly lame, but the execution of the ones shown are simply BAD! The Wimbledon “tradition” of insisting on all-white clothing is relatively new. Most of the clothing that was worn at Wimbledon in the 70s, 80s & 90s would be against the rules today. the spelling of the word “picture”. But beyond that…. This kid is doing everything possible to make himself look tallest and skinniest!! Even wearing #11! Re: ads on the field and uniforms in exchange for fewer commerical breaks. Right. But this thought experiment was about whether you’d make the trade if it meant they *didn’t* have as many commercials as ever. Right. I don’t know, it’s nice having a minute to get up for a break, and I’m still miffed about the Steelers italic font (from the late nineties is it?).. I don’t think I could handle seeing ads on Steelers uni. I would leave it the way it is. One missing from the personal logos of PGA players is Phil Michelson’s humorous silhouette of him jumping after winning his first major, The Masters, and getting all of two inches of air. huh??? i dont want a Fanatics Celtics jersey, i want a nike replica jersey. WTF is this crap? man im done with everything. The item on personal logos for pro golfers reminds me of the discussion of brands that appeared on these pages just recently; the idea of entities, whether persons or companies, being obliged to think of themselves as brands. You know what’s missing, though? A brand for Jason Day. A logo incorporating a “June-to-December” calendar acronym comes to mind. I actually kind of dig the Panthers training camp logo, although the resemblance to the “alien head” is certainly there. It’s really disappointing to see a historic building like the War Memorial get sold out like that. It’s on the National Register of Historic Places, for crying out loud! One pennant in 48 years, so we have to keep celebrating. I hope we get to celebrate something else some day. But why against Philly? Milwaukee plays STL enough during the season. I know, I know, the Cardinals won but it’s not like we don’t know that. The Brewers didn’t even play Philly in 1982. Unfortunately, Milwaukee doesn’t play the Angels this year, who they beat in the ALCS. At least that would make some sense. The Angels would be best, or maybe the Orioles after that last game of the regular season. Probably to goose ticket sales for what would otherwise be a bunch of missable games. Anything that reminds me of the Brewers having switched leagues kind of gives me the willies. So the ’82 commemorations, where they’re celebrating having played a World Series … against a team in their own current division? Ugh. 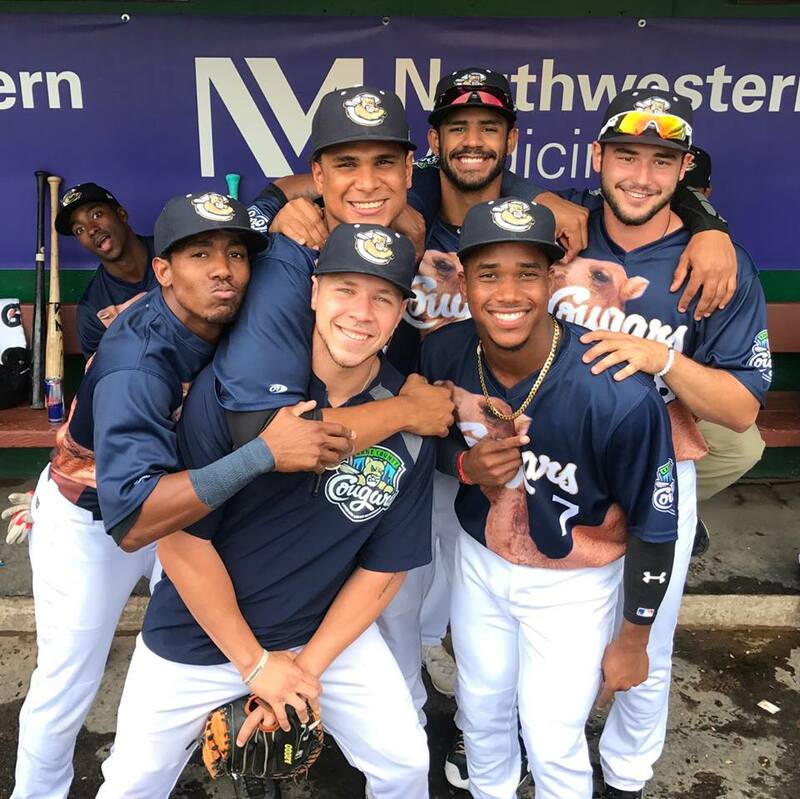 On top of which, the Brew Crew looks likely to go to the playoffs this year, and if they make the World Series, they’re likely to face the Houston Astros … who finished first in the Brewers’ current division when Milwaukee played its first National League season in 1998. Ugh. Teams shouldn’t switch leagues, darnit! And if they do, they should stop throwing anniversary parties for division and league titles won in the prior league. Not as a matter of principle, but just to avoid annoying me personally. There’s a strong psychology theme today. The Panther’s flag is a great example of a Gestalt Switch, that phenomenon where you first see an object one way (e.g. an alien head) and then suddenly you’re able to switch and see something that hidden in plain sight (e.g. oh, it’s actually panther heads). Our brains are strange machines. Thanks to Paul for the chance to share about synesthesia and to Scott M.X. Turner for doing an awesome job capturing my vision for my membership card. I really enjoyed the article today. Thanks for sharing, Scott! It was well written and illuminating. The part about pattern recognition is really interesting. I think that’s a huge part of our general brain operation and consciousness. Your descriptions remind me of experiences that I’ve had (and many others I’m sure) with various psychedelics—-good experiences, by the way. It’s difficult stuff describe, but a person like Scott has experienced it his entire life so he obviously has developed a great way of expressing it.